Hyosung High-torque, High-Performance muffler upgrade in a subtle design. Need a stock replacement then the Silent Pro is an affordable upgrade for everyday use. Racing Planet carries the greatest selection of Hyosung OEM replacement scooter parts and accessories. Including the full line of Tecnigas muffler scooter upgrades. 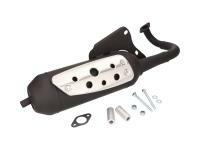 This exhaust will work on all private label Hyosung models sold in the USA of the SD 50, SF 50 model. Including United Motors Morini 50cc Xpeed models sold 2002-2012 and Kasea SF 50, Hyosung SF 50 R Rally 05- KM4CA15, Avanti 50 models sold under the KASEA USA name. Any SD or FD 50 CAB model can easily be upgraded with this Tecnigas performance muffler.